All new for 2014, the Liquid Force. Peak Wakeboard is team rider Nicos new all-around whip. Completely redesigned inside and out, the Peak features an all-wood core with a single concave into dual channel and concave tip. This hull shape allows Nico to ride finless in parks with complete control. Finned up, the Peak lets you edge as hard as you can with positive hold. Mid-body edge channels and a concave beveled edge complete the package to keep your PEAK performance in control and catch-free on any of your parks features. 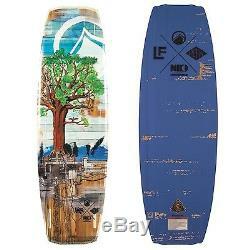 Dialed into Nicos own flex preference, youll expand your riding on the new shape of the Liquid Force. Note: This is a factory blem board and may have slight cosmetic damage. For a straight up pop behind the boat, and catch-free transitions in the parks, this rocker style works great in both worlds. Center Concave with Edge Channels. Concave softens landing and maintains speed while edge channels increase control and hold. Liquid Force Exclusive Liquid Rail. Elastometric sidewall created as the ultimate rail bond with unsurpassed durability. Give your board the ultimate beat down and the Liquid Rail will keep it protected. Catch-free on rails, extra bite on the water. All Wood CNC'd Core. Thin profiled lightweight core for increased board sensitivity and responsive flex. LF's special weave provides the proper spring & snappy flex. Durable Sintered base material for long lasting rail park fun. Liquid Force slider quad fin setup. A proven performance hull shape and the great flex properties of LF's hybrid construction. Hybrid Tech brings you a board that launches wake-to-wake AND delivers the goods for your park experience. The item "2014 Liquid Force Peak Wakeboard BWF" is in sale since Friday, August 12, 2016. This item is in the category "Sporting Goods\Water Sports\Wakeboarding & Waterskiing\Wakeboards". The seller is "awsfenton" and is located in Fenton, Michigan.